SWE 622, Spring 2017, Homework 3, due 3/22/2017 4:00pm. Each computer that is interested in using the filesystem will run its own copy of the filesystem driver (we’ll call it the CloudFS, or CFS for short). 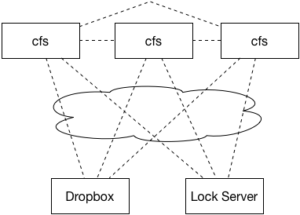 We’ll use Dropbox’s web API to provide the permanent storage, and will implement a cache of our Dropbox contents in our cfs driver. A lock service will make sure that only a single client writes to a file at a time (HW2). Over the course of the semester, we’ll set up the cache to be distributed among multiple CFS clients (HW3), distribute the lock server between the clients to increase fault tolerance (HW4), investigate fault recovery (HW5), and security and auditing (HW6). We’re going to start out by replicating our caching server. Thankfully, this task is made somewhat easier for us because we are building on top of Redis, which will do most of the heavy lifting. Recall that Redis supports master-slave replication out-of-the-box. In this model, a single Redis instance is the master, and any other instances are slaves. The master is in charge of performing all write operations and keeping the slaves up-to-date. In the event that a master fails, we could promote one of the slaves to become the master. In this assignment, we won’t yet consider failures, but instead will simply focus on getting CFS ready for that by introducing the replicas. What we WILL get to benefit from is hopefully a decreased load on the main cache server. Now, the “master” server will be used ONLY for writes, and each CFS client will perform reads from its own “slave” Redis server. To start moving towards fault tolerance, we’ll also investigate building a simple heartbeat protocol, enabling the server to keep track of how many active clients there are at any given time. Making sure all writes go to master, reads go to slave. Your implementation of Homework 3 should build directly on your successful Homework 2 implementation. Hence, it is very important that you take the time to correct any issues from HW2 that prevent it from running. Please note that you have three weeks to complete this assignment, and hence, the expectation is that the basic filesystem operations (opendir, get, put, mkdir, mkfile, unlink, rmdir) all work as intended independently of any problems that might occur due to the replication being introduced in this assignment. Note: This assignment does NOT evaluate the correctness of the lock server (as implemented in HW2), and does NOT evaluate the correctness of how you use it. Hence, if you did NOT do that correctly for HW2, you should NOT worry about fixing it to avoid being penalized further, because you won’t. HOWEVER, this does not change the fact that basic filesystem operations should still work “correctly” for a single client (e.g. not crash, mkdir should still make a new directory in most cases, etc.). If you have any questions on this topic please ask me directly. Start out by importing the HW3 GitHub repository. Then, clone your private repository on your machine, and import it to your ide. Copy your lock server from HW2 into your HW3 project. You may choose to start your HW3 CloudProvider from scratch, or build directly upon what you had in HW2 (in which case you should copy that code in to HW3 too). If you copy your RedisCacheProvider from HW2, please note that the constructor has changed for HW3 to pass not only the host and port for the redis master, but also for the intended slave. You’ll also find a Vagrantfile in the repository, similar to the configuration used for HW2, including Redis. The first time you start it, it will install the correct version of Redis. If it fails for any reason (for instance, network connectivity issues), try to run vagrant provision to have it re-try. At a high level, your task is to modify your edu.gmu.swe622.cloud.RedisCacheProvider so that: (1) it runs the heartbeat protocol, (2) all writes go to the master Redis server and all reads go to the slave server and (3) all writes are protected with WAIT calls. The CloudFS class has been modified since HW2: now every time that you start CFS, it will launch a new Redis server on a random port, configure it to be a slave to the main Redis instance, and pass that port to your CloudProvider, so that you can use the slave for reading. When you stop the CFS client, that Redis server will be terminated. One cool lesson learned from this assignment should be that it’s incredibly easy to do replication with Redis (just look at the very tiny amount of code inserted on line 126 of CloudFS to create the replica), but that it’s not so trivial to do it with specific consistency guarantees. You should copy your config.properties over from HW2. The first time you run it, you’ll need to re-authorize it for Dropbox (the config files that authorized it before were local to the HW1,2 VM). A good way to test this assignment will be to have multiple instances of CFS running, each mounting your filesystem to a different place. Then, you can observe if writes appear correctly across the clients. You can also independently test your heartbeat protocol by writing a stub that simply sends the heartbeat message and requests the number of active clients. Ultimately, our goal is going to be to make a best-effort attempt to make sure that every write gets to every replica. To do so, we’ll need to know how many replicas there are at any given point. One approach would be simply to have replicas message some server every time that they come online, and again when they disconnect. However, this wouldn’t account for the possibility of a replica failing at some point. One solution is to implement a “heartbeat” protocol, requiring the client to remind the server every so-often that it is alive. Then, the server can assume that if a client has not sent this heartbeat message recently that that client is offline. When a client comes online, it will call the register() method. The server will assign a unique ID to that client and return it back to the client. Then, every 30 seconds the client will call heartbeat(int) to the server, passing that unique ID that it was assigned upon calling register(). When a client intentionally wants to disconnect, it can call disconnect(int), passing its ID to the server. Any client can call getNumberOfActiveClients at any time. This function will always return the number of clients that have sent the register() message or the heartbeat() message to the server in the past 33 seconds (note that this way the server allows a 3 second “grace period” to account for various latencies). You are free to implement the server-side aspects of this however you like. One simple approach might be to keep a counter on the server to use to assign clientIds (perhaps an AtomicInteger), and then store a HashMap that maps from clientId to the timestamp of the most recent register or heartbeat message from that client. Disconnect would remove the clientId from that map. getNumberOfActiveClients would traverse the map and count the number of clients who have contacted in the past 33 seconds (let’s say that the server allows a 3 second grace period). You’ll be using this method in part 3. For our purposes, you can assume that the network is well-behaved, and the only way a client might fail is by crashing. Hence, if you don’t receive a heartbeat message from a client, you can assume that it is now offline and will never return (or if it returns, it will come back as a brand new client having no recollection of its previous state). This approach will be imperfect: in the real-world, we would want to take into account network partitions, where a single heartbeat message is lost, and then the client reconnects later. What should we do in that scenario? The answer will probably depend on a lot of things, and require some tinkering on both the client and server side. Hint: You’ll need to create a new thread on the client to send these regular heartbeat messages. Using a TimerTask might make sense. Modify your Redis filesystem cache in RedisCacheProvider. Note that the constructor for this class has changed: it now is passed two sets of port/hostnames to use for Redis – one will be the address and port of the master Redis instance, and one will be the address and port of a slave. We’ll want to redirect all WRITES to the cache to the master instance, and all READS from the cache (i.e. all queries that are NOT writes) to the slave. You’ll notice that in the provided base implementation of RedisCacheProvider, there are two JedisPools created – one for the master and one for the slave. This approach will (1) simulate a real-world environment where we utilized replication to reduce server load, and (2) demonstrate that the replication is working correctly. As in Homework 1 + 2, you are free to place your implementation across multiple methods/classes, but you may not modify CloudFS or CloudProvider in any way. At this point, you should have clients reporting to the server when they are alive, writes being directed to the master, and reads directed to a slave. We need to do something special though to try to maintain consistency given Redis’ replication model. As discussed in Lecture 5, Redis does not make any guarantees about how quickly a slave will receive an update made to a master. HOWEVER, we can add some constraint here by using the WAIT command just after performing every write. As its name might suggest, WAIT will prevent the client who is doing writing from proceeding until the write message is propagated to each replica. Hence, if we call WAIT after making a write (and before releasing our write lock), we can be confident that once WAIT returns and we release our lock, any future process to try to read that value from a replica will be talking to a replica that has received the updated value. How does WAIT know how many replicas there are that it should wait for? It doesn’t: you need to tell it. Conveniently, for this assignment there will be exactly as many Redis slaves as there are CFS clients: if there are 2 CFS clients running at once, then there will be 1 Redis master and 2 Redis slaves. Hence, you should use your getNumberOfActiveClients method just before calling WAIT to find out how many clients are currently active, and then WAIT for that many replicas to receive the write. Perform all of your work in your homework-3 git repository. Write your answers for Part 3 in README.md. Commit and push your assignment. Once you are ready to submit, create a release, tagged “hw3.” Unless you want to submit a different version of your code, leave it at “master” to release the most recent code that you’ve pushed to GitHub. Make sure that your name is specified somewhere in the release notes. The time that you create your release will be the time used to judge that you have submitted by the deadline. This is NOT the time that you push your code.